Copyright Patricia Patterson. Please do not right click without permission. Copyright Patricia Patterson. Filmwork by M.K.Davis. Please do not right click. Copyright Patricia Patterson. Filmwork by M.K.Davis. Please do not right click without permission. 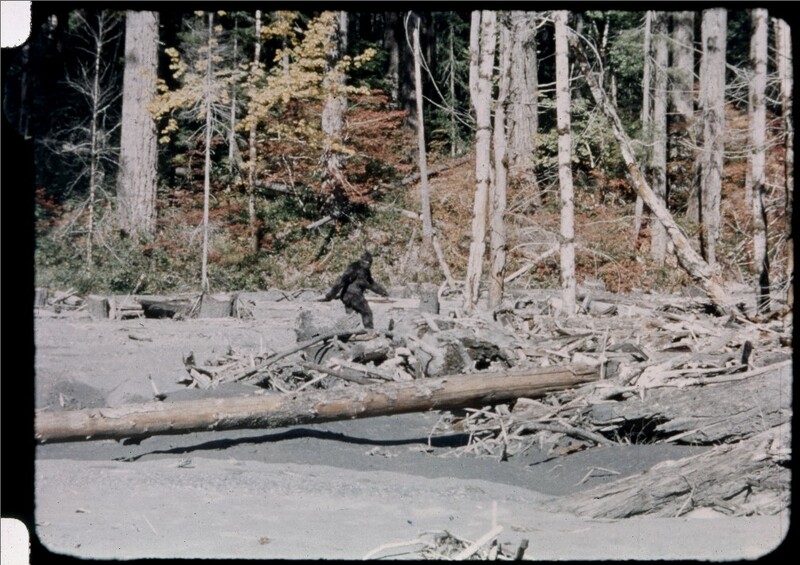 The stick that the Sasquatch stepped on. A close look at this makes me believe that it could be a flat object with a mobius type of twist to it. Click to enlarge. The Davis Report- The Origins of the Sasquatch? Often times, we humans study things to the point that we end up right back where we started from. When I say “study”, I mean professionally. We pay people to study things for us and then give us their results which most of the time, we rely on. There are some subjects, however, that do not give up their secrets very easily. In the case of the Sasquatch, we do not get our money’s worth with our paid professional approach. What we end up with, instead of a fact finding mission, is an agenda driven effort, in which the inquirer has ventured away; from true north, without a compass of facts. Realizing that they are lost, they begin to bake a pie of fallacy that they know everyone will love to eat. They then top it off with academia nuts that look so appetizing that this pie must really be something good to eat. When we get our slice of the pie, however, we discover that it truly is bitter to the taste. It’s not full of the good stuff that it first appeared to be. We hire first one professional… then another, but the pie is bitter still. Perhaps the first real thing that we can sink our teeth into, is the fact that we do not know everything that there is to know. We can’t even explain the people that we KNOW about in this country, because we did away with them as nations, so rapidly without adequate observations. 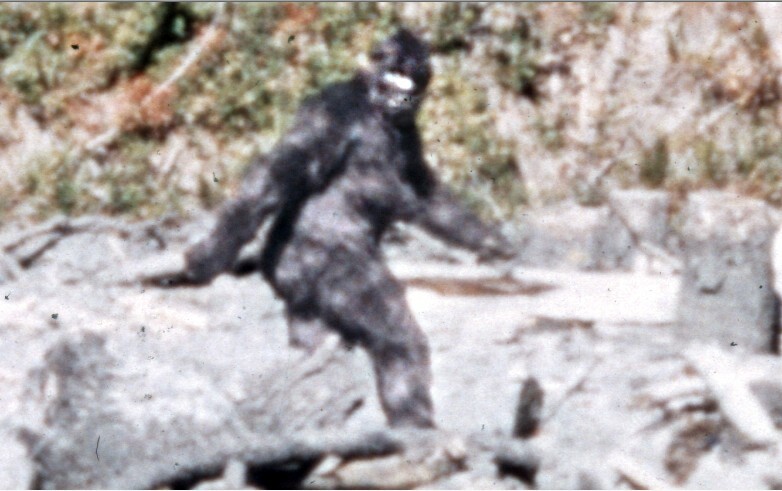 Yet…the people that we pay to investigate the Sasquatch for us, have filled every gap….and they stick to their story, because it’s as good as any other. This is NOT science at work. Rather…it is the failed human condition at work. The strangeness of history is manifest in what was left behind. Until it can be explained, it is better to call it “unexplained”, rather than explain it away. Here’s an example. Look at the image below. This photo was taken in a cave in the American west. Two very different types of handprints. 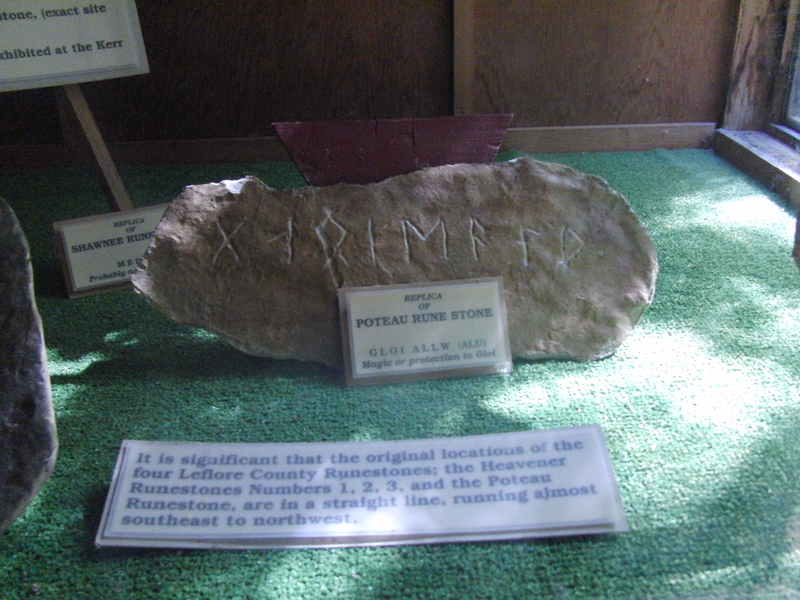 Here’s a stone in Heavener Oklahoma that has Nordic writing on it called “runes”. They are dated to 600 a.d. 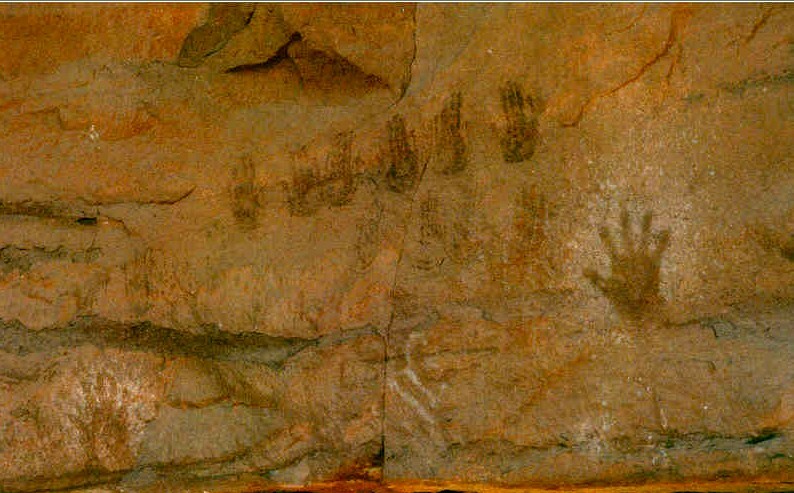 When first found, the local Indians were said to have made them. The University of Oslo Norway begs to differ. 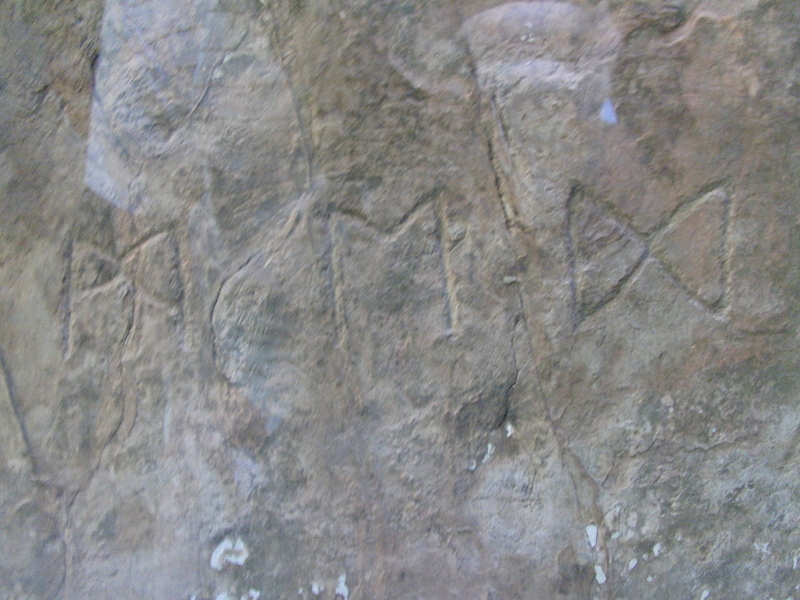 They say it’s a land boundary marker written in the oldest form of Nordic rune writing. Perhaps we have become a Euro-centric society. I mean the modern European efforts to settle the Americas, may have come centuries after it had already been located and settlements established. If we cannot accept evidence such as the runes and much more, then perhaps we have eaten too much of the bitter pie with the academia nuts on it. I highly encourage you all to keep your eyes open and your mind as well. There is much to be learned from the mystic garden that we call Earth…if you don’t already have a bitter taste in your mouth. After a close examination of the film, this observer comes to the conclusion that the film site had been visited by some form of equipment. This is contrary to the story about the event that had been told by the principals of the film. Alas though…a story is a story, and film is film. Here are some of the clips and stills that may lead a person to think otherwise. 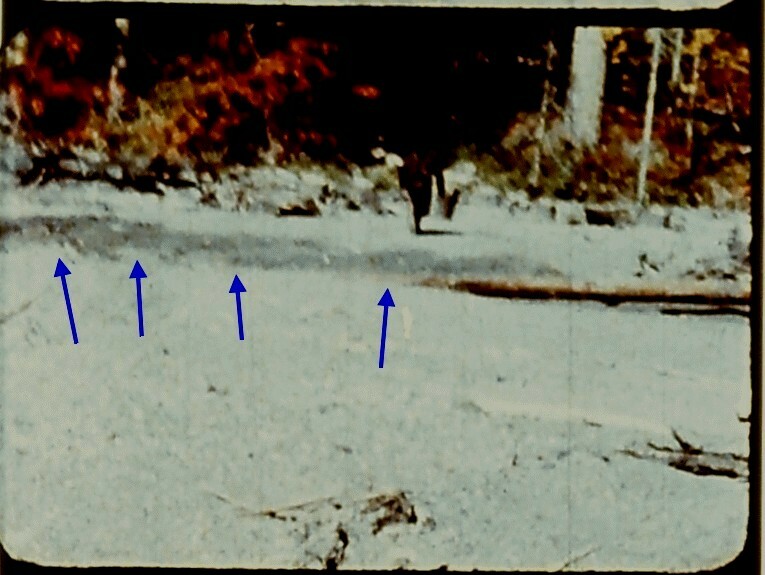 In this clip, the blue arrows point to where the log had been positioned in the soft and damp sand, BEFORE being pushed forward toward the camera position. It leaves a clear imprint of the log there. This big of a log certainly could not have been pushed in this way, by hand. The tracks of a piece of equipment can also be seen here. Click on the image to animate. Copyright Patricia Patterson. Film work and stabilization by M.K.Davis. Please do not right click without permission. 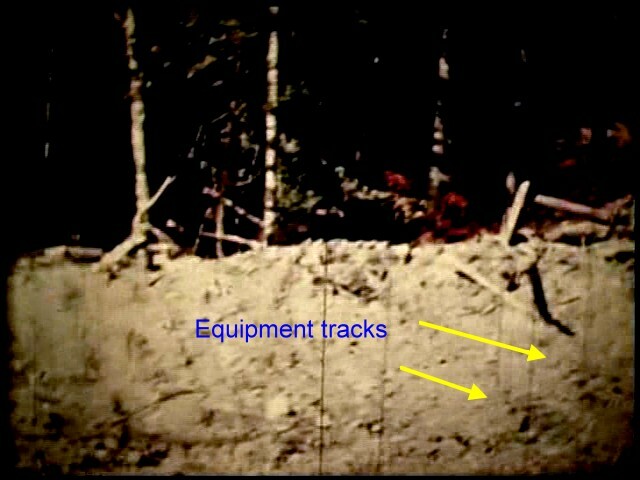 Here’s another still that shows what appears to be equipment tracks. Click on the image to enlarge. 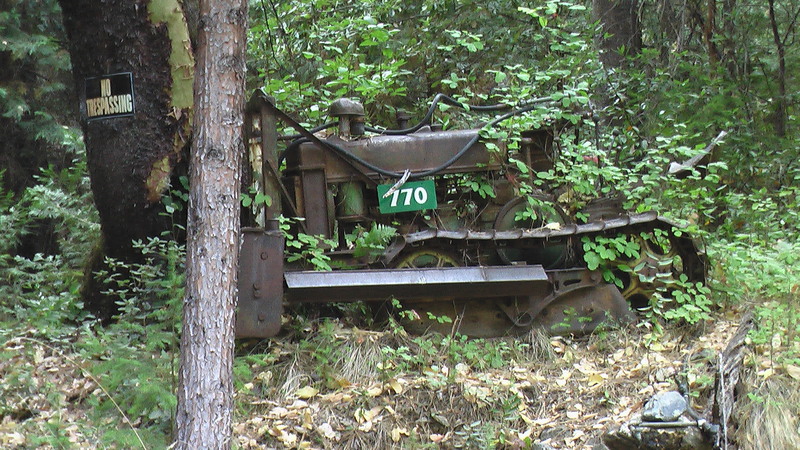 In the interview below, long time Willow Creek resident Al Hogdson talks about a backhoe that was owned by a local man and had been left at the Bluff Creek area. Could it be this backhoe that made the tracks seen in the film? Click on the image to listen to the interview. In the still photo below, the sand can be seen to be chopped up with linear trackways. Click on the image to enlarge. There is some evidence that a smaller type of track vehicle was used as well. Here’s a photo of such a vehicle still at the house of one of Roger Patterson’s good friend near Bluff Creek. Click on the image to enlarge. Copyright M.K.Davis. Please do not right click without permission. Most of what I have presented here thus far, has been with the “background” stabilized. In this file the subject itself has been stabilized. This gives the effect of “following” the subject with the camera on a secure mount. Click on the image to animate. The animation may take a minute or two to load. When it has run through once, it will then run at proper speed. Click on the image “twice” and it will enlarge further.